This is a partnered post with Provide Commerce and Social Media Chicks. All opinions are my own. As the children in my family get older, keeping with family traditions seems more and more important to me. There were certain things I could count on every Christmas as a child. That would be baking Christmas cookies in the kitchen with my Mom, adding new special ornaments to the tree each year, and opening our one gift on Christmas Eve (which was always a new pair of pajamas). Also, tearing into our stockings first thing on Christmas morning. These are traditions that have stuck with me throughout the years and have been practiced with my own son. I know my siblings have have shared these same traditions with their own children. Having so many miles between our family these days, it’s nice to send special personalized gifts for the holidays. One way I can do that is by giving my sisters, brother, and their families personalized gifts from Personal Creations to keep the family traditions of our childhood going. I adore the traditional appearance of these Knit Argyle Snowflake Stockings. My sister, Cat, and her boys are crazy about their sneakers. It’s crazy how many pairs of sneakers they have, compared to the one pair of white and one pair of black shoes in my own closet. These High Top Sneaker Stockings are just perfect for them. 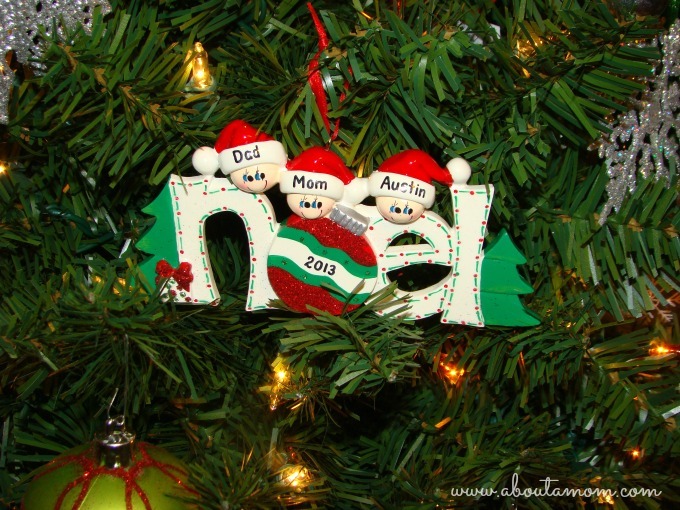 Personal Creations has such a nice selection of personalized ornaments. I particularly like the ones that include each member of the family. We add at least one special new ornament to the tree every Christmas. Just like when I was a kid, on Christmas Eve we all act surprised when we open our one package, although it’s always a new pair of Christmas pajamas. Tatiana and Keshawn are going to flip over their new Rudolph and Clarice Toddler Pajamas from Personal Creations. It’s now how certain holiday traditions stick with you throughout the years. What are some of your holiday traditions? 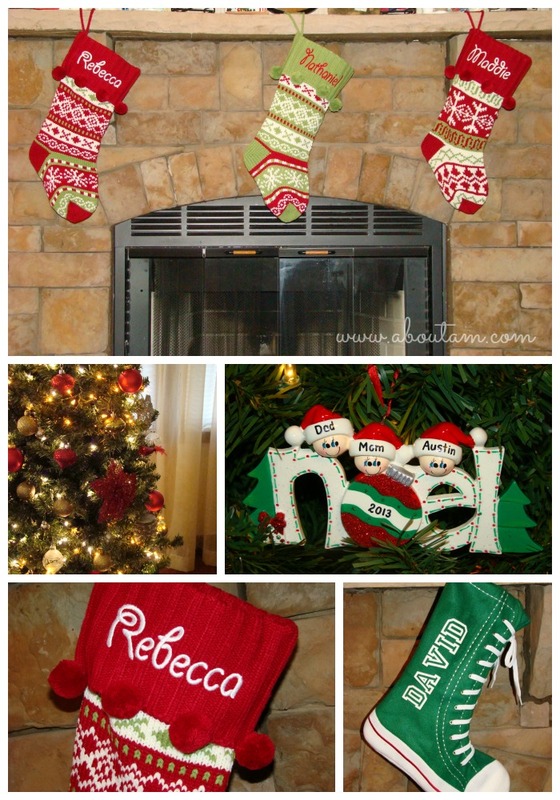 Are you ready to personalize your own Christmas creations? Personal Creations is offering my readers 20% off of all of your purchases through the end of December. Click here to start shopping and the 20% will be applied in your shopping cart. Oh I totally want the shoe stocking for my daughter she wears a pair just like those but black that is so cute! I am in love with their stockings. This is wonderful – absolutely visible how much love you put into it! I have the knit sock stockings and I love them!!! The shoe one is pretty darn cute as well. The little ones sure will look cute in their personalized jammies. Love the sneaker stockings, my teens would love them! Oh my goodness, those stockings are priceless! I soooo want one for myself, adorable! Those stockings are super adorable. Those rudolph pajamas are so pretty. My daughter would love them. We do stockings first thing, too! And, the jammies are adorable. I’ve never been one to do Christmas PJs, but this makes me wish I did. Oh my gosh! Those high top stockings are so neat! Thanks for sharing the discount offer. We own those stockings and love them!! Those pajamas are just darling! I love personalized items — especially at the holidays. I love everyone one of these, it is so hard to choose just one 🙂 BUT, I have to say I would the personalized PJ’s for my granddaughter! What a great job you did on all of those! I love your stockings and ornaments, but I especially love those Converse-boot style stockings! The sneaker stockings are amazing. I know our Nephews would flip for those. I absolutely love the personalized gifts. Such adorable items! I love the sneaker shoe stockings! Those sneaker stockings are too cute, I’ve never seen them before. The oddest Christmas stocking we used to have is when my late husband hung one up for the cat. He got it at a pet store, and it was filled with cat toys and treats. He used to even write the cat’s name on it with glitter glue! Your decorations look so great! Personalized stuff is the best! It is nice to create crafts and tradtions that can be shared and carried on from year to year within our families. My sister does the new pajamas on Christmas Eve tradition with her girls. I think that’s so cute! Love all the stockings! I absolutely love the sneaker stockings! I have got to have one! It’s funny how seemingly small things like stockings, ornaments, and Christmas pajamas foster the magic of Christmas, but they really do! I hope you and your family have a wonderful holiday season together. I love personalized gifts so much! And these look amazing! This is so cute, I love the Rudolph pj’s super cute!!! I sure hope my Clarice pj’s show up in time for the holiday! I love them the most! It’s our favorite special of the season. I love those stockings! And I’m dying over the pjs! I didn’t realize they had those! I want some now! OMG! These shoe stocking are too cute. I love the little details in all of the items! 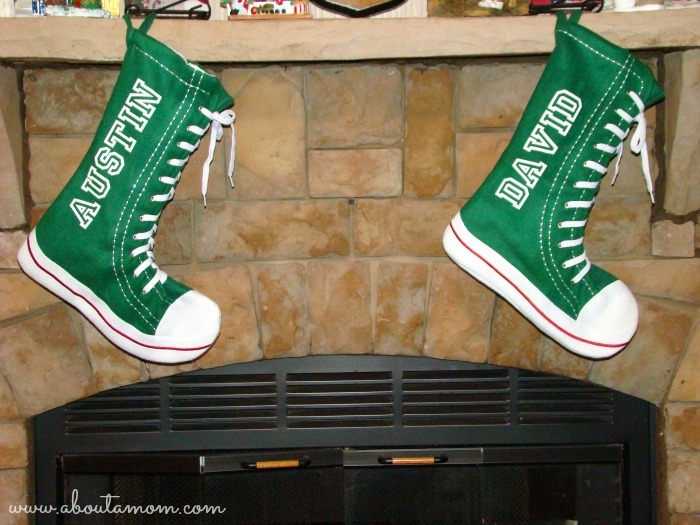 My boys would love the Personaized Sneaker Stockings!!! Thanks for sharing the discount! 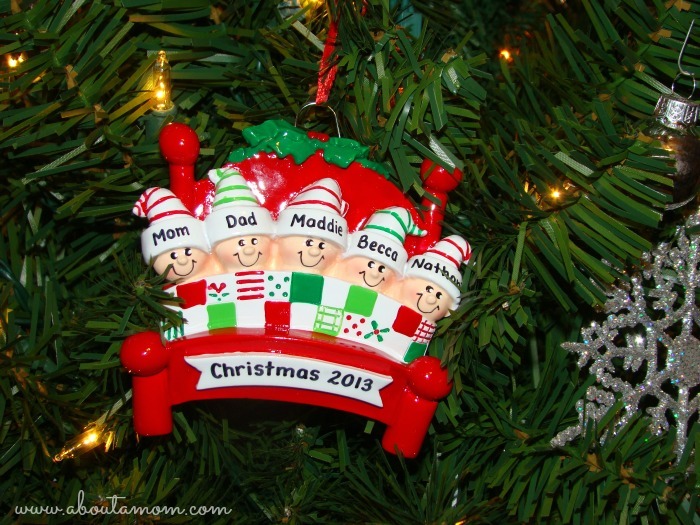 We love our stocking and ornaments from Personal Creations. 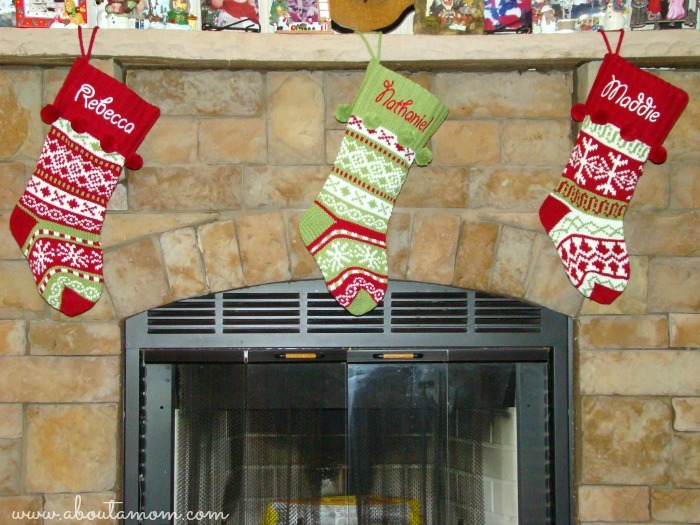 The stockings look so beautiful on our mantel. We have not had stockings for the kids in a very long time. Cute decorations. Love the sneaker stockings. This year we started making a holiday tradition. It’s nice that your family has this. OK, the High Top Sneaker Stockings are just awesome LOL! We love Personal Creations! I just love the pj’s and the stockings!! Too cute! I love those green sneaker stockings. I want to get them for the hubby and son. those sneakers are so cute. We always opened 2 presents on Christmas Eve, PJs and one other we could pick. How cute! Personal creations always has great things! I love the sneaker socks! Those Chuck Taylor look a like stocking are so awesome! I may have to look into making those! Sounds similar to our Christmas traditions! I love decorting cookies or Gingerbread houses with my son! I got the idea this year from pinterest to put pjs, hot chocolate packet, a Christmas book, and a Christmas movie wrapped under the tree to open for Christmas Eve! My son is 10 so I will make these memories last…they go so quickly as kids grow up. Merry Christmas! I am a big fan of personalized items. All your stockings are so cute and beautiful, loved the colors and designs especially the converse stockings, so cool! Our family traditions are so similar to yours. We open one present on Christmas Eve which are pajamas and dive into our stockings on Christmas morning. I like the ornament idea too. I can’t wait till my daughter and grandchildren make the Christmas cookies. I love the PJ’s! Those are so cute! My daughter would love to have those. I love giving and receiving personalized gifts. It shows you put some thought into the gift. The stocking would be great for a new baby. Those pj’s and stockings are super adorable. And those ornaments…I love them.